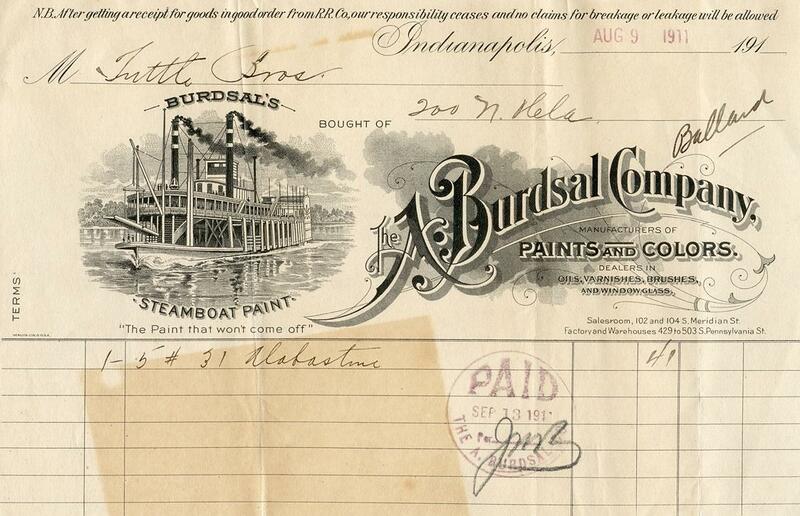 Nice vignette of a sidewheeler on a receipt from Burdsal's Paint Company of Indianapolis; dated 9 August 1911 promoting "Steamboat Paint" which was probably copyrighted as a specialty item within Burdsal's product line. The paint is described in the 1917 article below as a "paste" which implies that it was intended to be either laid on very thick or thinned down with water or turpentine depending on the application it was to be used for. 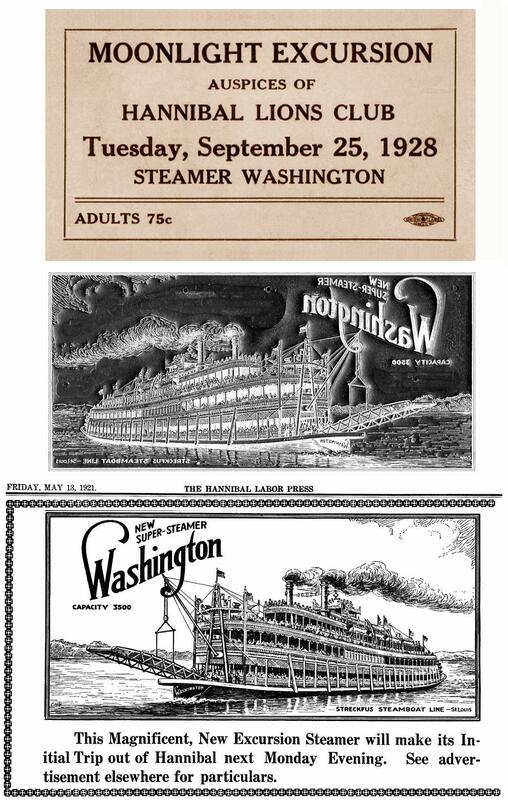 It's possible that "steamboat paint" was initially designed to be used on the interiors and exteriors of steamboats and its chemistry chosen for durability from exposure to the elements outside and extremes of temperatures and humidity outside and inside, in particular when it was applied near the boilers and engines. Alfred Burdsal established the paint business in 1875 and it was incorporated in 1892. The company was still listed in city directories in the 1920s. "The A. Burdsal Company Is, among the oldest manufacturers of ready mixed paints In the United States. It was established In 1867, and this year marks Its fiftieth anniversary. The first can of mixed paint was manufactured in New York city in 1862, five years before the organization of the Burdsal company. Indianapolis stands, therefore, among the pioneer cities in the manufacture of paint. William Bonnet, sales manager of the Burdsal company pronounces the Burdsal factory one of the most modern and best equipped in the entire country. His experience in paint manufacture reaches from coast to coast, and is in a position to speak authoritatively on the rank of the Indianapolis company. 'We manufacture paints and stains and paint products,' said Mr. Bonnet. 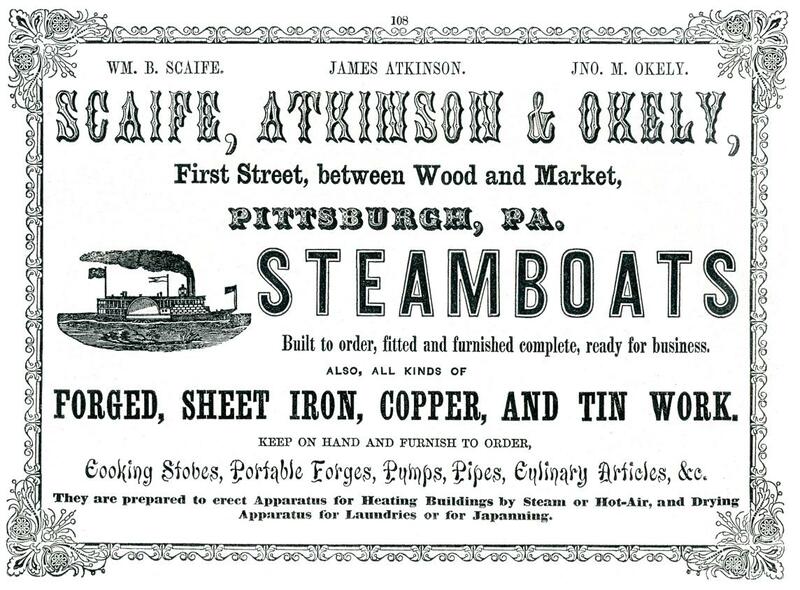 'Homestead Paint, ready for use, and Steamboat Paint, a paste, are our leading brands.'" 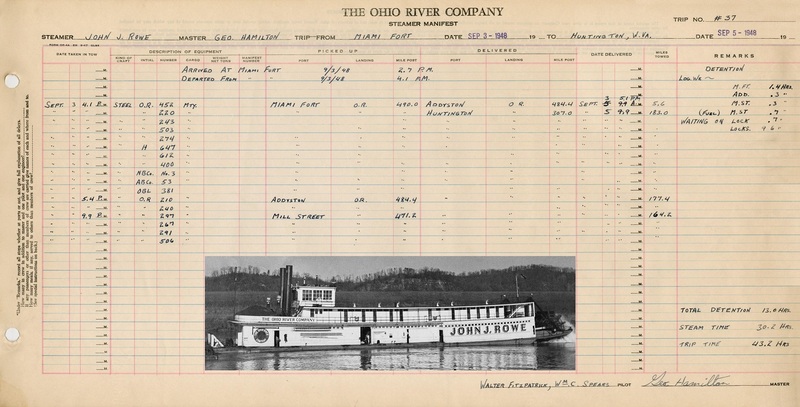 From a dealer in Charleston, West Virginia I was fortunate to obtain the original bound 1948 log book for the towboat JOHN J. ROWE. The 49 log pages were printed forms filled in with ink by hand and measure 11.05 X 21.85 inches. A Google search for Holbrook came up with a riverman from that community who was probably the same person. Stevens & Grass Funeral Home in Malden, West Virginia published the following obituary for James Tony Holbrook 1945 - 2013 from whose collection this log book very likely originated from. James Tony Holbrook, 67 of Campbells Creek passed away Thursday June 13, 2013 at home of natural causes. Tony was born in Catlettsburg, KY on August 8, 1945 to the late James & Grettie Holbrook. He was a River Boat Captain and currently held a position as purchasing agent at Port Amherst Industries. A memorial service will be held Tuesday June 18, 2013 at 1:00 PM at Stevens & Grass Funeral Home, Malden. Family and friends may gather one hour prior to the memorial service on Tuesday. from Miami Fort to Hamilton, W. VA.
171 5 x 34.6 x 7 2. Condensing engines 16's,32's-8 ft. stroke. Babcock & Wilcox boilers, installed 1948, coal burner, automatic stokers. The original owner was Campbell Transportation Co., then the Mississippi Valley Barge Line Co. (MVBL) who sold her, in fall of 1947, to The Ohio River Co., Cincinnati, OH. In June, 1955 she was renamed ORCO. Editor's note: we have several pages of towboat photos, please refer to Museum index - click here. The map and the color graphic far right are on the cover, the black and white section is the title page. 72 pages all together, 4.10 x 9.00 inches. I upgraded the black and white photo of the CAPITOL. 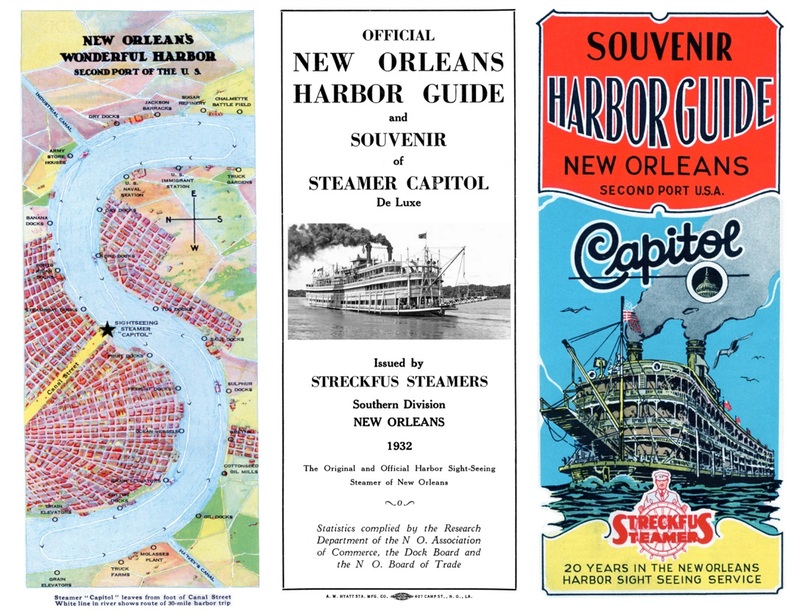 The new steamer "INGOMAR" will arrive in a few days and take her place in the New Orleans trade, leaving Memphis and New Orleans on each alternate Saturday in conjunction with the H.R.W. HILL. In fitting out this new and splendid boat, no pains and expense have been spared to make her one of the best boats on the Mississippi. For comfort and convenience of arrangement she cannot be surpassed. Great care and attention have been given to the procuring of safe and competent officers. Shippers and the traveling public can rely upon punctuality. Louis LeBreton (1818 - 1866) was a French painter who specialized in marine paintings. Le Breton studied medicine and took part in Dumont d'Urville's second voyage aboard the ASTROLABE as a surgeon. After the official illustrator of the expedition died, Le Breton replaced him. Beginning in 1847 Le Breton devoted himself exclusively to depicting marine subjects for the French Navy. He travelled with Dumont d'Urville's expedition to the South Pole and Oceania from 1837 to 1840. From 1845-1847 he was part of an expedition to Madagascar. LeBreton produced tinted lithographs and chromolithographs on naval forces, ships and boats, sea landscapes and ports of call such as New Orleans, Louisiana. Most likely from the 1852 Pittsburgh city directory. 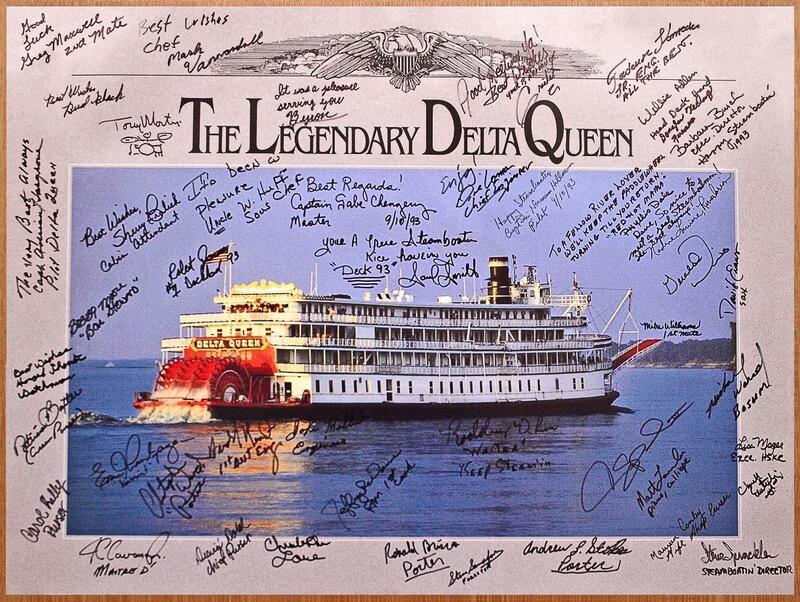 Steamboats built to order, fitted and furnished complete, ready for business"
I bought this 18 x 24 inch poster in the DELTA QUEEN's gift shop in Sept '93 and over a span of days en route from Memphis to Cincinnati I took it around and requested folks employed on the boat to sign it for me. It's too clumsy to scan in pieces and reassemble so I photographed it instead and finessed it in Photoshop to enhance it a bit. 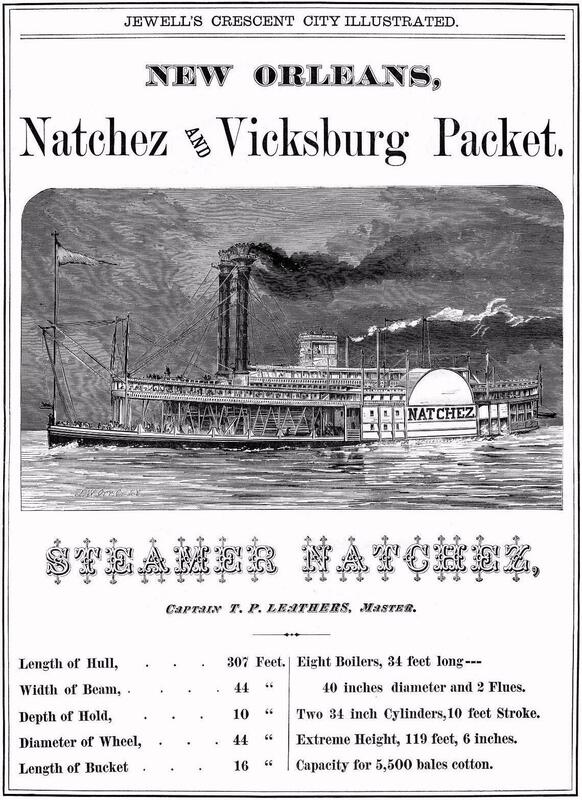 From JEWELL's CRESCENT CITY ILLUSTRATED a local New Orleans, a full page original advertisement for one of Cap'n Leathers' series of boats named NATCHEZ. Jim Hale believes that this is probably the 6th boat by that name. There was no date on this piece which was yellow with age. I cleaned it up in this hi con version. The reduced scan produced a "moray pattern" in the sky which of course the original doesn't have. Undated advertising card featuring the BELLE OF THE BENDS that was built at the Howard Steamboat Yards of Jeffersonville, Indiana in 1898. 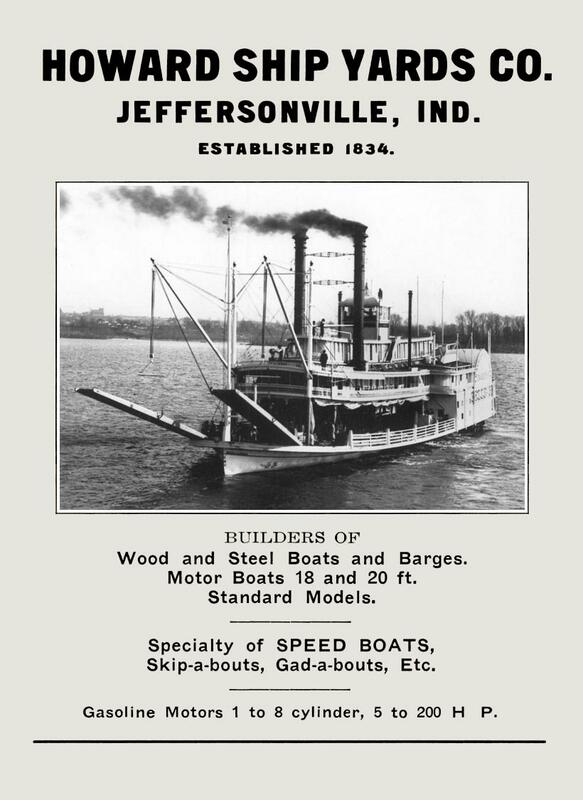 Built in 1898 at Jeffersonville, Indiana by Howard Ship Yard for Vicksburg and Greenville Packet Company, J.J. Powers president and D.C.B. Robinson supervised construction, both of Vicksburg. The Howard Ship Yards in Jeffersonville, Indiana on the banks of the Ohio River were established in 1834 by nineteen-year-old James Howard who and began to build his first boat, the HYPERION. 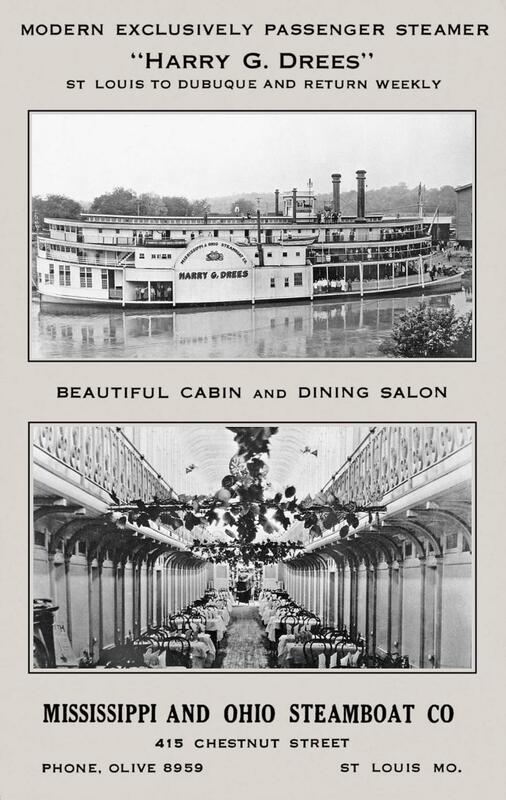 Howard built steamboats included, the luxurious J.M. WHITE, the speedy CITY OF LOUISVILLE and the popular INDIANA. Howard's beautiful 1894 mansion home was built by master craftsmen from the shipyard who created many of the details in the decor of the mansion. The home is now the Howard Steamboat Museum and features original furnishings, brass chandeliers, stained glass windows, intricate carvings throughout and are featured in the grand staircase. Models, photographs, paintings, half-hull models and other artifacts can also be enjoyed at this unique Jeffersonville museum. The Howard Steamboat Museum is open year round. Unused stock certificate for The California Transportation Company Incorporated March 31st 1927 Photographic vignette of the DELTA QUEEN or DELTA KING featured in the upper third of the certificate. Top: 1928 Hannibal Lions Club moonlight excursion ticket for Tuesday Sept 5thCenter: Original lead printer's block identical to the one that printed the newspaper ad below it. Note that Fred Way, Jr. served as one of the pilots aboard the WASHINGTON from 1934 to 1937. Built in 1880 as the SIDNEY the hull was made at Murraysville, West Virginia and the balance of construction completed at Wheeling, West Virginia. Rebuilt at Mound City, Illinois in 1921 and renamed WASHINGTON. Had four boilers from the GREATER NEW ORLEANS; operated on the Ohio River Owned by Streckfus Steamers, Inc., St. Louis and was managed by Captain D. Walter Wisherd, based at Cincinnati, then at Pittsburgh. The WASHINGTON damaged her bow when she struck the lower lock gate at Dam #8, Ohio River on August 16, 1936, with no injury to passengers. In 1937 she operated part of the season, and was dismantled at St. Louis in 1938. Captain Coburn Pratt (master); Captain Edgar F. Mabrey (master); Captain C. W. Elder (master); Lee Willis (pilot); Grover Litten (pilot); Homer Litten (pilot); Charles H. Ellsworth (pilot); William I. Weldon (pilot), Phil C. Elsey (pilot); William S. Pollock and Fred Way, Jr. (pilots, 1934-1937). "The new Montgomery island dam in the Ohio river east of here will be dedicated by United States engineers on Saturday, August 29. Colonel W. E. R. Covell of Pittsburgh, chief of engineers, will head the war department delegation. 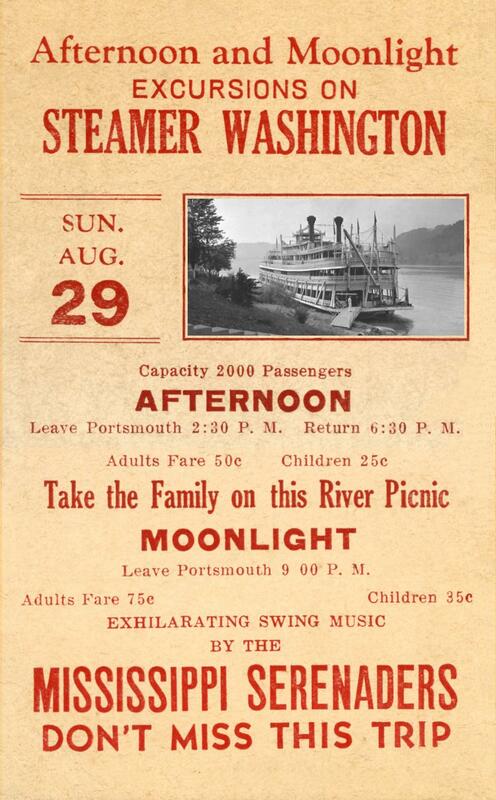 A steamboat parade, with the excursion boat WASHINGTON as the flagship, has been planned. Numerous towboats, the packet GORDON C. GREENE and scores of small motor craft will participate."